Protein power for everything. All day long. Our Beef jerky is the perfect protein booster. Perfect for the office. As a snack on the go. Or directly after training. In other words: Wherever, whenever. Your body will thank you for the essential amino acid kick after a strenuous workout. We use the very best cuts of beef for our Beef Jerky. The meat for our Beef Jerky is cut from the juicy silverside and all fat and sinews are removed by hand, before the meat is air-dried. This meticulous process carried out by hand maintains a particularly high protein content, while the fat content in our Beef Jerky is kept to a minimum. This is how our power booster is made. A varied and balanced diet and a healthy lifestyle are essential. Not suitable for people with the following allergies: Soy. Beef jerky is the perfect high-protein snack after training, as a snack between meals or on the go. It should be stored at room temperature and once opened, a packet should be finished within two days. The oxygen absorber in the pack is not edible! Beef jerky supplies the body with premium quality protein from pure beef and boosts the body’s energy levels. That is why dried meat is an excellent source of protein for muscle building. Who should use Beef Jerky? The native Americans have trusted in the power of beef jerky for millennia. They needed readily-available energy on their long treks. That's why they created their very own stone age snack. They cut buffalo meat into thin strips and dried it in the sun. Once dry, it was then smoked over their campfires. For extra flavour, they added special herbs. That is how they created a handy snack that would give them the energy they needed for their long hunts. 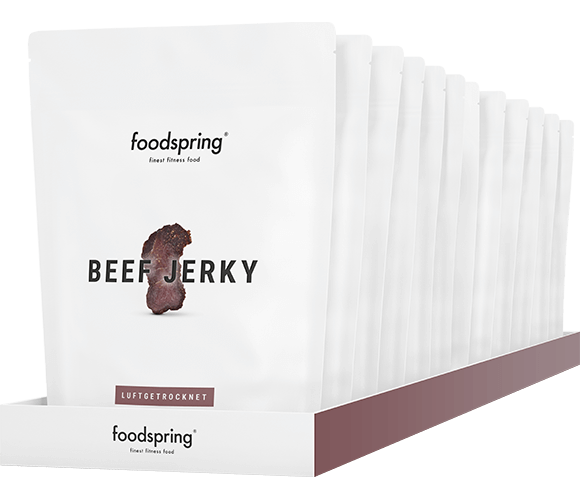 The premium quality Beef Jerky by foodspring is made exclusively from the meat of grazing cattle from Scotland and the UK. The production process meets strict European quality standards. Many beef jerky products are made in the US. As we only use premium beef from Scotland, our Beef jerky has a very high protein content with very little fat. In order to comply with highest quality requirements, all fat and tendons are meticulously removed from the low-fat muscle meat by hand. It is then cut into thin slices or strips, dried and coated with homemade marinade and salt before curing. That is how our Beef Jerky becomes the perfect, low-calorie snack for on the go. The properties of our Beef Jerky make it a perfect snack as part of a high-protein diet or for athletes working on muscle building. As we use only premium quality beef, our Beef Jerky is an excellent source of essential amino acids like BCAAs, the performance booster creatine, and iron. The essential amino acids leucine, isoleucine and valine (BCAAs) play an important role in muscle performance. They support protein synthesis (permanent generation and degeneration processes in protein elements) and protect muscle mass, which is particularly important in reduction diets. The most important aspects of calorie deficit diets is maximum muscle maintenance and simultaneous body fat reduction. A sufficient supply of BCAAs facilitates this process and actively supports weight loss. Protein-rich snacks have proven to be intelligent helpers as part of a weight-loss diet or a muscle-building regime. As far as nutritionists are concerned, protein and the benefits it provides play a major role in the success of a diet. Protein-rich snacks like beef jerky provide energy and make you feel full. Our Beef Jerky consists of over 50% protein. In terms of feeling full, protein is proven to be far superior to carbohydrates and fats because of its complex structure. Beef Jerky can therefore suppress desires for high-calorie snacks and sweets. Beef jerky is also a valuable source of creatine. Creatine enhances physical performance, especially in short, intense workouts. This is particularly helpful for basic exercises like deadlifts, squats, bench presses or for short sprints and various jumps. As beef jerky is made purely from beef, it is particularly rich in iron. An iron deficiency is one of the most common deficiencies when it comes to micro nutrients. An iron-deficient body will suffer long-term from low performance capabilities and frequent signs of fatigue. Beef jerky can help counteract this micronutrient deficiency. Beef jerky is a great source of protein and provides important protein elements and essential amino acids for muscle building. It supports successful training regimes for muscle building. Beef jerky is the perfect, low-calorie snack at work as an alternative to sweets etc. The long-term feeling of fullness due to the high protein content can be particularly helpful for people who often have food cravings. Beef jerky is an excellent snack option for outdoor activities and a quick energy booster. The iron content promotes the oxygen flow in the blood and therefore increases both physical and mental performance. Beef jerky is super versatile. You can also use it for cooking or as a topping. The dried beef is an excellent salad garnish and adds flavour to soups. All the positive properties of beef jerky we have talked about make it a fantastic, protein-rich snack for on the go. You can eat it right after training, at work or while traveling - beef jerky supplies the body with premium quality protein from pure beef and boosts the body’s energy levels. Beef jerky is therefore also a great addition to any diet aimed at muscle building. It should be stored at room temperature and once opened, a packet should be finished within two days. The oxygen absorber in the pack is not edible. It ensures that the beef jerky keeps its aroma long-term and prevents premature oxidation of the meat. Anyone looking for an intelligent and most of all protein-rich snack should try beef jerky. The great versatility of beef jerky means that it is suitable for everyone: athletes, professionals and anyone wanting to maintain a healthy diet. Beef jerky can help you achieve your fitness goals and promotes muscle building as well as body fat reduction. The very high protein content helps to maintain muscle mass, while supplying muscle tissue with the necessary essential amino acids. The most important factor in beef jerky is the quality of the beef used in its manufacture. Premium quality will make a big difference in terms of taste. Premium quality beef jerky is made exclusively from the meat of grazing cattle. Many products use turkey or chicken as a "substitute" for the more expensive beef. The characteristic taste of beef jerky is lost in these products. Additionally, these products contain many additives like artificial colourants. The idea of "natural" beef jerky goes completely out the window. Product experts and local farmers work hand in hand in the development and processing of our foodspring Beef Jerky. That is how we can guarantee maximum quality and absolute purity for our Beef Jerky. 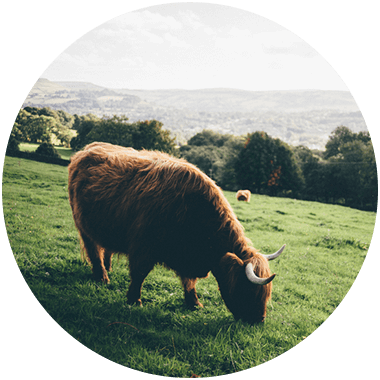 You van buy premium beef jerky made from Scottish and UK premium grazing cows right here in our online shop. How is beef jerky produced? Meat cut from the silverside is hand-trimmed to remove the fat and tendons and then air-dried. Our recipe also uses our own homemade marinade, which gives our beef jerky a unique taste. What makes beef jerky such a great snack? Beef jerky’s high protein content makes it the perfect snack for people concerned about a healthy diet. Proteins leave the body feeling fuller for longer. This multi-talented nutrient is important both in muscle building and for a low-carb diet. Why does your beef jerky taste so good? We add flavour to our beef jerky with our own homemade marinade based on a traditional South African recipe. Where do you get the meat for your beef jerky? The meat in our beef jerky comes primarily from Scotland. Depending on availability, we also source some meat from other parts of the United Kingdom. Animal welfare is very important to us, as are short production routes where possible. Beef Jerky 12 portion pack will be back in stock shortly.